Once installed, the HIPS watches all file system activity on your computer. 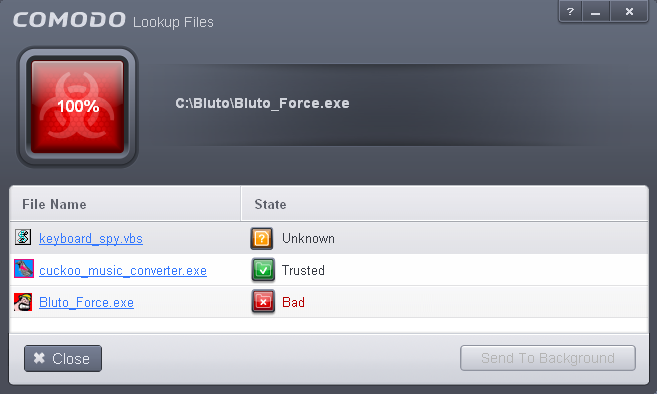 Every new executable file introduced to the computer, is first scanned against the Comodo certified safe files database. If they are not safe, they are added to the 'Unrecognized Files' for users to review and possibly submit to Comodo. Apart from new executables, any executables that are modified are also moved to the 'Unrecognized Files' area. 'Unrecognized Files' is specifically important while HIPS is in 'Clean PC Mode'. In Clean PC Mode, the files in 'Unrecognized Files' are NOT considered clean. For more information, please check 'Clean PC Mode' on the HIPS settings page. The 'Unrecognized Files' panel displays the list of files added as Unrecognized Files and allows you to assess the pending files to determine whether or not they are to be trusted. If they are trustworthy, they can be moved to 'Trusted Files' using the 'Move to' button. Similarly, files that are suspicious can be moved to the 'Blocked Files' area. 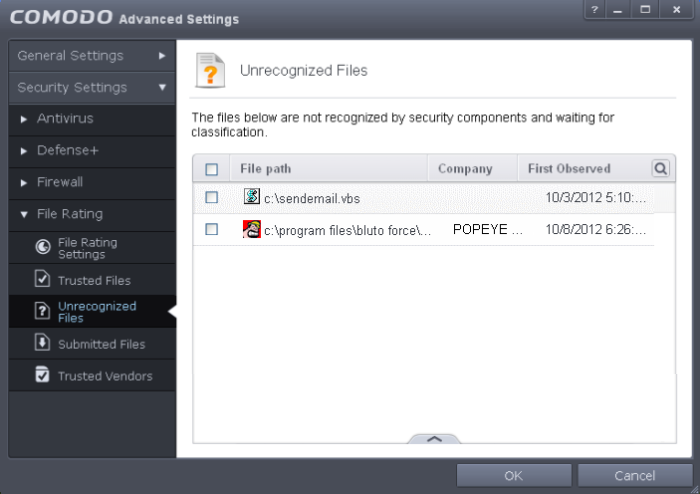 You can also add files upon which you are suspicious into 'Unrecognized Files' list to check whether the master Comodo safe list contains more information on them or to submit the files to Comodo for analysis. Experts at Comodo will analyze the files and add them to global white-list or black-list accordingly. You can use the search option to find a specific item in the list. Submit - Begins the file submission process. Purge - Runs a system check to verify that all the files listed are actually installed on the host machine at the path specified. If not, the file is removed, or 'purged', from the list. Folders - Allows you to navigate to the folder you wish to add. All the files in the folder will be added to the 'Unrecognized Files' list. Running Processes - Allows you to select a currently running process. On selecting a process, the parent application, which invoked the process will be added to 'Unrecognized Files' list. Click OK for your changes to take effect. Select the entry to be transferred out of the 'Unrecognized Files' list into either Trusted Files or Blocked Files. You can select several entries to be moved at once by marking the check-boxes beside the entries. Choose 'Trusted Files' or 'Blocked Files' from the drop-down. Select the entry to be removed from the 'Unrecognized Files' list. You can select several entries to be removed at once by marking the check-boxes beside the entries. Click the handle from the bottom center and choose 'Remove'. The file is only removed from the list and not deleted from your system. Select the file to be checked from the 'Unrecognized Files' list. You can select several entries at once by marking the check-boxes beside the entries. Click the handle from the bottom center and choose 'Lookup...'. Comodo servers will be contacted immediately to conduct a search of Comodo's master safe list database to check if any information is available about the files in question and the results will be displayed. If a file is found to be malicious, it will be indicated as 'Bad' with a red icon. You can move it to Blocked Files. If the file is found to be safe, it will be indicated as 'Trusted' with a green icon. You can move it to Trusted Files. If no information is available, it will be indicated as 'Unknown' with a yellow icon. 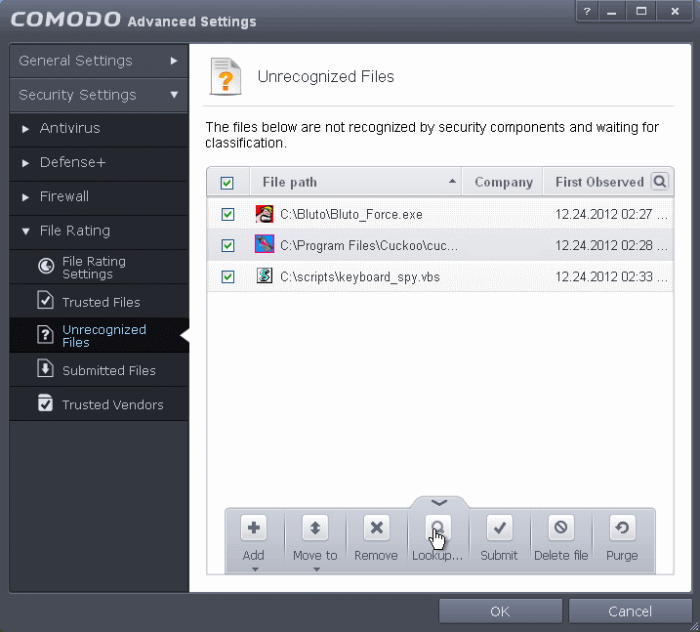 You can submit the file to Comodo for analysis. Select the entry to be submitted from the 'Unrecognized Files' list. You can select several entries to be sent at once by marking the check-boxes beside the entries. Click the handle from the bottom center and choose 'Submit'. The file(s) will be immediately sent to Comodo. You can view the list of files you submitted so far, from the Submitted Files panel.